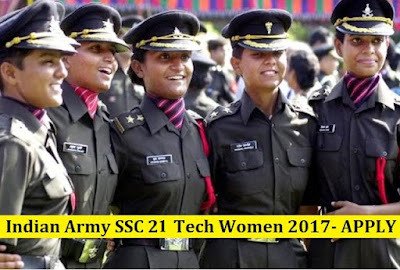 Hello Aspirants, looking for SSC Entry 21 Tech Women 2017 Indian army recruitment we have a good news for you as Indian army soon will be announcing Applications for Candidates can apply for 21st Short Service Commission (Technical). 21st Short Service Commission (Tech) Women Course (JULY 2017) (INCLUDING WIDOWS OF DEFENCE PERSONNEL FOR NON-TECH ENTRY) (commencing at Officers Training Academy (OTA), Chennai for commission in the Indian Army in all Arms/Services. Interested and Eligible candidates can apply online by reading article from the official website of Indian army on or before 2017. Feel free to ask below in comments regarding SSC Tech Women Entry. Age Limit : – SSC(T)-21 Women:- 20 to 27 years as on 01 Oct 2017 (Candidates born between 02Oct 90 and 01 Oct 97) (both dates inclusive). (ii) SSCW(Non Tech)(Non UPSC)- For Widows of Defence Personnel only (withfour years age relaxation). 19 to 29 years (Candidates born between 02 Jul 88 and 01 Jul 98) (both dates inclusive). when will the forms for ssc tech women July 2017 entry will out? Im an architect m I allowed gor ssc tech?